Source: eARC provided for review, thank you! And both are scared that uncovering the truth about themselves will force them apart.They’re right. I don’t think I’ll ever be able to write a full, long review of this book because it’d be full of spoilers. 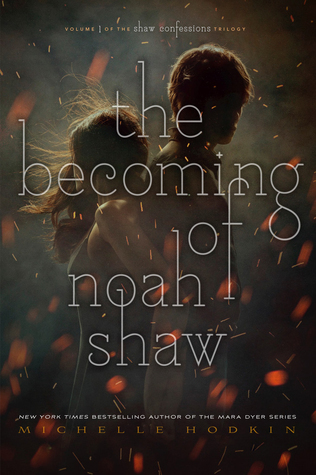 So, just let me tell you this: The Becoming of Noah Shaw will NOT disappoint you. If you enjoyed the Mara Dyer trilogy, then you’ll definitely enjoy this one, too. It has all the things that made The Unbecoming of Mara Dyer unforgettable: nerdy conversations, gore, mystery, darkness and that passionate and all consuming love between Mara and Noah. Please be aware, the first thing I noticed when I started reading it were the trigger warnings. I don’t even remember all of them, but if the first page (on my kindle) was full of trigger warnings, then you know this is going to be fucked up. The plot was just as intriguing and puzzling as the previous trilogy, and even though there are answers to questions from Mara’s books, the mystery never ends. Michelle Hodkin brings back her old characters and puts them in way more complicated situations, testing them, and testing us. While there isn’t a love triangle at sight (thank you!) the ending is still heartbreaking and full of angst. I am actually dying to read the next book, but I wasn’t expecting less.